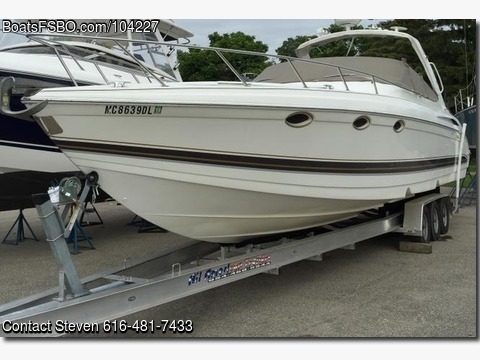 FRESHWATER 2002 FORMULA 370 SS This freshwater Formula has been owned by the same owner for 13 years and always kept on a lift on Lake Charlavoix in upper Michigan. $7000 was spent in 2017 on hull reconditioning and cosmetics inside and out. New Mercruiser Bravo “x” drives installed 2013 with 750 hours on the twin 496 HO’s Mercruiser engines ( 425 HP each-top end 64 mph) . 100 watt stereo with 6 speakers in the cockpit, Rayman radar, depth finder, head, 2 refrigerators, A/C, winless, spotlight, and more. Boat runs and drives excellent. Never camped on but used as a day boat. Call Steve 616 481 7433; sebratschie@bratschie.com for more information.